Background: Obstructive sleep apnea (OSA) is a common, under-recognized, under diagnosed, under treated, and serious medical condition in adults. Polysomnography (PSG) is the gold standard for diagnosis of OSA; however, prohibitive cost of the test and rarity of sleep laboratory in the Arabic nations limit its access. So, searching for another simple, economical, reliable, and valid tool for identification of OSA at risk patients is of special public concern. Objective: This study was conducted to evaluate the reliability and validity of Arabic version of Berlin questionnaire (ABQ) in detection of OSA at risk patients. Methods: After hospital ethics approval and formal patients consent, 100 patients were subjected to full night PSG study after their response to the developed ABQ. The patients were classified into both low (30) and high risk (70) for OSA using ABQ and validated against apnea hypopnea index (AHI). Reliability was assessed by internal consistency using Cronbach's alpha test and consistency over time using test retest correlation. Results: The study demonstrated a high degree of internal consistency and stability over time for the developed ABQ. The Cronbach's alpha coefficient for the 10-item tool was 0.92. Validation of ABQ against AHI at cutoff >5 revealed a sensitivity of 97%, specificity of 90%, positive and negative predictive values of 96% and 93%, respectively. Conclusion: The ABQ is reliable and valid scale in screening patients for the risk of OSA among Arabic-speaking nations, especially in resource-limited settings. Untreated sleep apnea is shown to be involved in a causal relationship with many deadly diseases such as coronary artery disease,  stroke,  systemic hypertension, , and pulmonary hypertension. There are also severe socioeconomic impacts of untreated sleep apnea; for example, there is a three- to seven-fold greater prevalence of motor vehicle accidents in drivers with untreated sleep apnea. Furthermore, the reported data indicate that the undiagnosed OSA is associated with large increases in healthcare costs in working age populations. Workers with the combination of OSA and excessive daytime somnolence are at increased risk of both recent work disability including work absences and decreased productivity and longer-term work duty modification of OSA and resultant sleepiness on work disability. , Because of the seriousness of the illness and the life-threatening consequences of untreated sleep apnea, increasing public and employer awareness of OSA to help identify undiagnosed cases of OSA would appear to be a valuable strategy from an economic and public health perspective. Polysomnography (PSG) is considered to be the gold standard for diagnosis of OSA;  however, prohibitive cost of the test and long waiting lists limit its widespread access. The Berlin questionnaire was an outcome of the Conference on Sleep in Primary Care, held in April 1996 in Berlin, Germany. It is an instrument validated to use in the western population to determine the occurrence of risk factors for OSA, namely snoring behavior, wake-time sleepiness or fatigue, and the presence of obesity or hypertension. The questions were selected from literature to elicit factors or behaviors that consistently predicted the presence of sleep-disordered breathing. , The questionnaire had symptoms about snoring, excessive daytime sleepiness (EDS), obesity, and hypertension. Questions about these symptoms demonstrated internal consistency (Cronbach's a correlations, 0.86 to 0.92). The predictive performance of the Berlin questionnaire has been evaluated in the population of Cleveland, Ohio, with a sensitivity of 86% and specificity of 77%. To the best of our knowledge, no such study has been reported in Arabic and no special Arabic form. 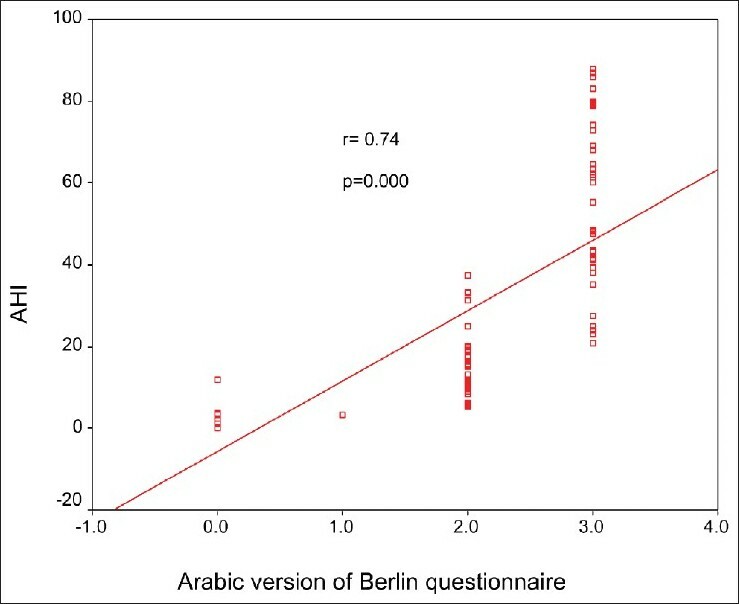 Therefore, the aim of this study is to evaluate the reliability and validity of Arabic version of Berlin questionnaire (ABQ) in detection of OSA at-risk patients. A sample of 100 adult patients attending the outpatient clinic of sleep disorders breathing unit, chest department, Mansoura University Hospitals, for evaluation for OSA was recruited during the period from February through August 2010. Subjects of either gender in the age group of 18 to 60 years and residents of Mansoura City and near areas were considered eligible. Exclusion criteria were patients with history of alcoholism, chronic anxiolyatic/sedative drug use, associated respiratory, renal, hepatic or cardiovascular disease, or upper respiratory tract infection within the past four weeks, as well as those who were pregnant or critically ill.
A cross-sectional study was conducted for all patients who met the inclusion criteria and provided written informed consent. The Institutional Review Board of Mansoura Faculty of Medicine approved the study. A specially designed questionnaire concerning the patient's demographic data including age, gender, residence, smoking habits, and occupation was administered. To simplify and for more clearance of the developed ABQ, the questionnaire includes 10 items; five items on snoring (category I, items 1-5), three items on daytime somnolence (category II, items 6-8), and two items on the history of hypertension and/or body mass index (BMI) >30 kg/m 2 (category III, items 9, 10). The questionnaire also includes information about age, gender, height, and weight. The ABQ was scored as previously reported by Netzer and colleagues. The overall score is based on the patients' responses to each of the three categories of the ABQ and with assistance of the researchers to explain the items for the illiterate and low-educated patients and evaluation of hypertension and BMI in patient respond to the corresponding questions by not know. Therefore, category III becomes more objective to increase the accuracy of the tool. The snoring or daytime somnolence categories are positive if responses indicate persistent symptoms (>three to four times a week) on the questionnaire items. A positive score on the third category requires a history of hypertension or a BMI of greater than 30 kg/m 2 . Study patients were classified as being at a high risk of having sleep apnea if scores were positive on two or more of the three categories. Those patients who scored positively on less than two categories were identified as being at a low risk of having sleep apnea. For the modification of the developed ABQ, it is simple to use 10 questions and classify them to 3 categories and to be clearer, we used square boxes around the positive responses in each items. A final result chart with three category squares collects the result of each category and lastly the two squares for the final conclusion to be used as computerized form. For each subject, we obtain a "high risk" (score ≥2) or "low risk" (score <2) score for OSA [Appendix 1]. Berlin questionnaire was translated into Arabic separately by two bilingual translators (the two authors). The two versions were combined and revised and then back translated into English. The translation was refined after back translation until agreement was obtained among the translators. Five bilingual experts (staff members of Public Health and chest departments, Faculties of Medicine, Mansoura University) examined the Arabic version of the questionnaire for content and construct validity and agreed upon it. Pilot study was conducted on a sample of 10 subjects (not included in the large-scale study) to examine the clearance of the tool and the reliability using alpha Cronbach's test. All patients who completed the questionnaires were invited to undergo an overnight in-laboratory polysomnographic study regardless of their score on the questionnaires. The polysomnographic data used in this study were extracted from overnight sleep studies. Sleep studies of patients who slept less than 6 hours with sleep efficiencies less than 90% were subjected to another night sleep study. The sleep architectures and apneas/hypopneas were scored according to the manual of American Academy of Sleep Medicine, 2007. Apnea-hypopnea index (AHI) for the studied patients was used for validation of the developed ABQ. AHI >5 per hour was used as cut-off for defining OSA, since our study was performed to validate the questionnaire in subjects at risk for OSA and not to identify the patients with moderate and severe OSA. Cronbach's Alpha Coefficient measured the internal consistency of the developed ABQ. Coefficients above 0.7 are generally regarded as acceptable, 0.8 and above are good, and 0.9 and above are considered excellent. Spearman's rank-order correlation coefficient testing was used to evaluate test retest reliability and to determine the relationship between the estimate of risk on the developed Arabic Berlin questionnaire and the patients' AHI. Data were analyzed using Statistical Package for Social Sciences (SPSS) version 11. P ≤ 0.05 was considered statistically significant. The study consisted of 100 sleep clinic patients. They were screened using the developed ABQ into low risk for OSA (n 0= 30) and high risk (n = 70). Males comprised 40% and 55.7% of low- and high-risk groups, respectively, with no significant difference. The mean age and height for the low-risk patients were 43.36 years and 161.40 cm, respectively, while the mean age and height for high-risk patients were 46.61 years and 162.50 cm, respectively, with no statistical significant differences between both groups (P > 0.05). The mean BMI of low- and high-risk groups was 25.01 and 41.19 kg/ m2 , respectively, with high statistically significant difference (P < 0 0.001). Frequency of patients with BMI >30 were highly significantly higher among high-risk compared with low-risk groups (P <</i> 0.001). Coefficients of Cronbach's alpha were 0.92 for the 10 items ABQ, 0.91 for the 5 Category I items, and 0.72 for the 3 category II items. All were of good to excellent range of internal consistency. The Category III was one item. 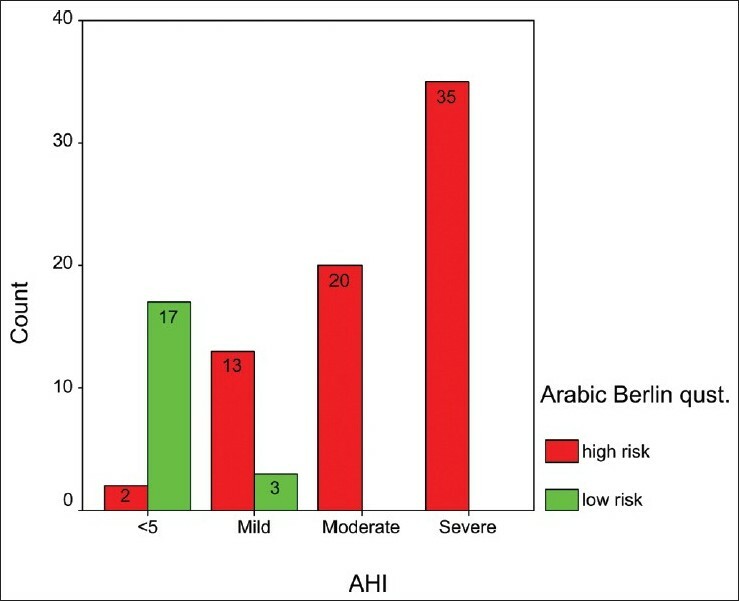 The distribution of the AHI grades in the high-risk and low-risk groups as screened by ABQ is shown in [Figure 1]. Prevalence of AHI ≥5 among patients attending sleep clinics for sleep complaints was 81 (81%), mild AHI was16 (16%), moderate was 20 (20%), and severe was 35 (35%). About 98% of high-risk patients with ABQ reported AHI >5 with overnight PSG. Also, a good positive highly significant correlation was found between ABQ and AHI [Figure 2]. Validation of ABQ against AHI at cutoff ≥5 revealed a sensitivity of 97%, specificity of 90%, positive and negative predictive values of 96% and 93%, respectively [Table 1] and [Table 2]. The developed competent and simple designed ABQ, validated in Sleep Disordered Breathing Unit, Chest department Faculty of Medicine, Mansoura University, demonstrates that ABQ is an excellent tool for the estimation of OSA risk in patients referred to the outpatient clinic of Sleep Disordered Breathing Unit. 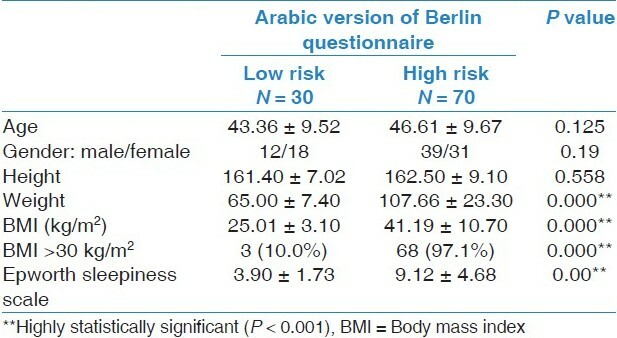 Compared with the aforementioned studies, our results showed that the Arabic Berlin questionnaire had high levels of sensitivity and specificity in OSA-suspected patients (97% and 90%, respectively) and high positive and negative predictive values (96% and 93%, respectively). These findings provide initial evidence toward the reliability and validity of the Arabic Berlin questionnaire as screening tool for detection of OSA at-risk patient attending outpatient clinic for evaluation of OSA in the Arabic nations. Our study does not agree with the recent study by Ahmadi et al. who reported that the BQ performed with only 0.62 sensitivity and 0.43 specificity with large number of false negatives and positives but this study was a retrospectives; the BQ data were obtained from the charts of the patients, BQ had been completed by the patients before their initial consultation with a sleep specialist, and data were collected from large sleep clinic including the department of psychiatry of a tertiary care center; the patient population is very diverse and diagnosis includes various sleep disorders, not only OSA patient as in our study. Second, the mean BMI of the population in this study was 41.19 ± 10.70 in high-risk patients and BMI were >30 in 97.1% in high-risk patients that were much higher than that reported in the study of Ahmadi et al. with mean BMI of 28; this increase the sensitivity and specificity of the ABQ, as the BMI also objective factor heavily into the of The ABQ. Lastly, patients with OSA commonly endorse symptoms of EDS  fatigue. Hence, this study also determines the relationship between ABQ and Epworth sleepiness scale with significant comparison with each other. The questionnaire had symptoms about snoring, EDS, obesity, and hypertension. The population in this study was assessed for sleep-related breathing disorders. So, it was homogenous population. Internal consistency of the Arabic version using alpha Cronbach's test of the three category items were 0.92 and both the first two categories were of good to excellent range. These results are somewhat comparable with the Sharma et al. Report of internal consistency of 0.92 to 0.96 and Netzer et al. who demonstrated internal consistency (Cronbach's a correlations  0.86 to 0.92). The ABQ is reliable and valid scale in screening patients for the risk of OSA among Arabic-speaking nations, especially in resource-limited settings. 1. Young T, Evans L, Finn L. Estimation of the clinically diagnosed proportion of sleep apnea syndrome in middle-aged men and women. Sleep 1997;20:705-6. 2. Young T, Finn L, Peppard PE, Szklo-Coxe M, Austin D, Nieto FJ, et al. Sleep disordered breathing and mortality: Eighteen-year follow-up of the Wisconsin sleep cohort. Sleep 2008;31:1071-8. 3. Schafer H, Koehler U, Ewig S. Obstructive sleep apnea as a risk marker in coronary artery disease. Cardiology 1999;92:79-84. 4. Hung J, Whitford EG, Parsons RW. Association of sleep apnoea with myocardial infarction in men. Lancet 1990;336:261-4. 5. Bixler EO, Vgontzas AN, Lin HM. Association of hypertension and sleep-disordered breathing. Arch Intern Med 2000;160:2289-95. 6. Dyken ME, Somers VK, Yamada T. Investigating the relationship between stroke and obstructive sleep apnea. Stroke 1996;27:401-7. 7. Nieto FJ, Young TB, Lind BK. Association of sleep disordered breathing, sleep apnea, and hypertension in a large community-based study. Sleep Heart Health Study. JAMA 2000;283:1829-36. 8. Teran-Santos J, Jimenez-Gomez A, Cordero-Guevara. The association between sleep apnea and the risk of traffic accidents: Cooperative Group Burgos-Santander. N Engl J Med 1999;340:847-51. 9. Reuveni H, Greenberg-Dotan S, Simon-Tuval T, Oksenberg A, Tarasiuk A. Elevated healthcare utilisation in young adult males with obstructive sleep apnoea. Eur Respir J 2008;31:273-9. 10. AlGhanim N, Comondore VR, Fleetham J, Marra CA, Ayas NT. The economic impact of obstructive sleep apnea. Lung 2008;186:7-12. 11. Omachi TA, Claman DM, Blanc PD, Eisner MD. Obstructive sleep apnea: A risk factor for work disability. Sleep 2009;32:791-8. 12. Riley RW, Powell NB, Guilleminault C. Obstructive sleep apnea trends in therapy. West J Med 1995;162:143-8. 13. Sharma SK, Vasudev C, Sinha S, Banga A, Pandey RM, Handa KK. Validation of the modified Berlin questionnaire to identify patients at risk for the obstructive sleep apnoea syndrome. Indian J Med Res 2005;124:281-90. 14. Netzer NC, Stoohs SA, Netzer CM, Clark K, Strohl KP. Using the Berlin Questionnaire to identify patients at risk for the sleep apnea syndrome. Ann Intern Med 1999;131:485-91. 15. The sixth report of the Joint National Committee on Prevention, Detection, Evaluation, and Treatment of High Blood Pressure. Arch Intern Med 1997;157:2413-6. 16. Ciurigniotta F, D'Alessandro R, Partinen M, Zucconi M, Cristina E, Gerardi R, et al. Prevalence of every night snoring and obstructive sleep apneas among 30-69 year old men in Bologna, Italy. Acta Neurol Scand 1989;79:366-72. 17. Wu H, Yan-Go F. Self-reported automobile accidents involving patients with obstructive sleep apnea. Neurology 1996;46:1254-7. 18. Cronbach LJ, Warrington WG. Coefficient alpha and internal structure of tests. Psychometrika 1951;16:167-88. 19. Johns MW. A new method for measuring daytime sleepiness: The Epworth sleepiness scale. Sleep 1951;14:540-5. 20. Johns MW, Hocking B. Daytime sleepiness and sleep habits of Australian Workers. Sleep 1997;20:844-9. 21. The AASM Manual for the Scoring of Sleep and Associated Events: Rules, Terminology and Technical Specifications 59 pages. ©2007 American Academy of Sleep Medicine. 22. Ahmadi N, Chung SA, Gibbs A, Shapiro CM. The Berlin questionnaire for sleep apnea in a sleep clinic population: Relationship to poly somnographic measurement of respiratory disturbance Sleep Breath 2008;12:39-45. 23. Gami AS, Pressman G, Caples SM, Kanagla R, Gard JJ, Davison DE, et al . Association of atrial fibrillation and obstructive sleep apnea. Circulation 2004;110:364-7. 24. Iber C, Ancoli-Israel S, Chesson AL. The AASM Manual for the Scoring of Sleep and Associated Events: Rules, Terminology and Technical Specifications 59 pages. ©2007 American Academy of Sleep Medicine. 25. Guilleminault C, Dement WC. 235 cases of excessive daytime sleepiness. Diagnosis and tentative classification. J Neurol Sci 1977;31:13-27. 26. Chervin RD. Sleepiness, fatigue, tiredness, and lack of energy in obstructive sleep apnea. Chest 2000;118:372-9. Authors of Document Seizer, P., May, A.E. Yunus, A. and Seet, W. and Mohamad, A.B. and Haniff, J.
Acar, H.V. and Kaya, A. and GenÃ§, F. and Erdem, M. and Ceyhan, A. and Ã–zgen, F. and Dikmen, B.
Amra, B. and Nouranian, E. and Golshan, M. and Fietze, I. and Penzel, T.
Geiger-Brown, J. and Rogers, V.E. and Han, K. and Trinkoff, A. and Bausell, R.B. and Scharf, S.M. Authors of Document Bensman, T.J., Nguyen, A.N., Rao, A.P., Beringer, P.M.